Filipino food lovers will have the exciting chance to become part of a gastronomic exploration of Filipino cuisine on “The Food That We Are,” a Lifestyle TV four-part special hosted by renowned Cebuano native, Chef Tatung premiering on October 16 (Sunday). “The Food That We Are” is based on Chef Tatung’s book produced by ABS-CBN Publishing titled “From Heart to Platter” that takes viewers on a journey to understand and appreciate the essence of the Filipino culinary landscape. Chef Tatung leads the introspective exploration by tracing the ancestral roots of the Filipino people to uncover how Philippine dishes like tinuktok (coconuts noodles wrapped in taro leaves) was established. 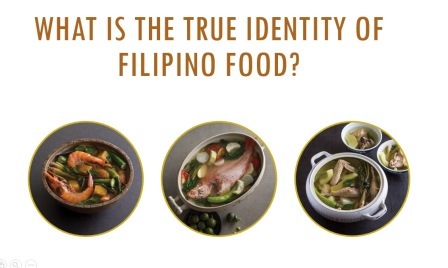 In the four-part special, viewers see how the wide cultural influences helped shape Filipino cuisine, how ancient cooking practices transcended time, and the significance of traditional ingredients in the modern Filipino kitchen. “This show is close to my heart because I am passionate about Philippine cuisine. I want Filipinos to appreciate the vibrant culture and history of how our delectable dishes came to be through this in-depth exploration,” Chef Tatung said. “The Food That We Are” is another Lifestyle original production adding to the list of hit shows the channel has produced like “The Crawl,” “Metabeats,” “Curiosity Got The Chef,” “Food Prints,” and “Listed.” Lifestyle is one of the channels of Creative Programs, Inc., a subsidiary of ABS-CBN that aims to give Filipinos a complete lifestyle experience while gaining meaningful insights.